They replied, ‘Master of the Universe, what is it? Many years ago, then-Chief Rabbi of Great Britain Lord Immanuel Jakobovits, zt”l, spoke on BBC Radio about scientific and technological advances taking place at the time. Some of these were exciting and positive, and offered cures for many terrible conditions and diseases. Others, however, threatened to change the very nature of the human being. The phrase “designer babies” was much in the news then. Science was very close to offering the possibility of manipulating genes to create babies according to their parents’ preference in gender, appearance (hair and eye coloring) and even intellect. He concluded his broadcast by pointing to Shabbos, which we keep in order to attest to the fact that Hashem is the Creator of the world, Who set the rules. To stop creating, it seems, is a far harder challenge than creating. That is a problem people have always struggled with. We continue to struggle with it. Intriguingly, it is a challenge men struggle with more than women, writes Harav Shimon Schwab, zt”l, on Parashas Vayeira in his sefer Maayan Beis Hasho’eivah. There is a huge difference between men and women when they daven. You can see this easily at the Kosel Hamaaravi. Women usually stand with their siddur close to their faces, quietly and sincerely imploring Heaven to change a decree or grant a request. Almost always, tears fall on the pages of their siddur when they do. Men, though, often have their hands stretched toward heaven, and sometimes those hands are balled into a fist. They are wrestling and fighting Heaven’s decree, trying to “storm” the gates of Heaven to change it. If you listen at the men’s side of the Kosel, individual prayers are often anything but “quiet.” Women seem more willing to accept Heaven’s decree, no matter how much they would like to change it. Men seem determined to exert every possible effort to alter those decrees. Shabbos comes along and tells us “fixers” to stop fixing things, to stand back and leave the fixing to the only One Who really can. The ultimate act of creating is to know when to stop creating. The mann that fell in the Midbar was precisely enough for each family’s needs. It came without our efforts; when we inserted our efforts into the process and tried to gather more than we estimated we needed, that “more” was wasted. Hashem lets us understand not to “tinker” with Shabbos’ message that ultimately He decides and directs our lives and decides how much health, wealth and everything else we should get (that of course includes our children’s gender, the color of their hair and eyes, and even their intellect). It is better, as women’s tears attest, to know when to stop trying to change our world — that is, Hashem’s — and leave things up to Him. Rav Dessler questions the words “all the work that He had done”; Hashem does no “work”! Hakadosh Baruch Hu simply “thinks” and something exists — there is nothing that could be described as work in the process. Many times Rav Dessler points to the word in Lashon Hakodesh for “world”: olam. The three-letter root of this four-letter word is elem, which means to hide or hidden. To create a world whose ultimate purpose is to allow freedom of choice, so that we can develop our emunah and choose to seek Hashem, He would have to hide His existence from us (at least until we start to look). That means that the world seems to work the way it always has: through cause and effect. One thing produces another; an action produces a reaction. Plant a seed and gather a crop, invest in a stock or bitcoin and watch your investment grow. The world demands that we rush frenetically from one meeting, email or phone call to the next. It keeps us too busy adhering to the “rules” that produce our income and mortgage payments to consider that we could exist if we didn’t keep those rules. On Shabbos, Hashem tells us to tear up the world’s demands and its rule book. The manic world that lies outside our homes and our neighborhoods halts. He stopped the “work” of creating that world on the seventh day. On Shabbos, Hashem stops “hiding.” Olam Hazeh offers a taste of Olam Haba, where Hashem does not hide at all. The Shabbos greeting in Lashon Hakodesh is “Shabbos Shalom.” There is a unique peace and tranquility that descends on Yidden when we say goodbye to this cause-and-effect world and to trying to “fix” and “create” things. I once heard a story about a Jewish father who lived in a small town in Poland. At the beginning of the twentieth century and the arrival of mass production, automobiles became more common. One of this man’s sons bought a car and drove it to his town. It was the first of these wondrous machines anyone there had ever seen, and everyone wanted to have a ride in the marvel. The Jewish son soon realized that he had a great business opportunity and began to charge people for the privilege of driving them up and then down the main street. The business proved very lucrative. Despite his father’s appeals, he continued driving the people of the town up and down the street even after Shabbos had arrived. The weeks passed, and his profits piled up. Then he became seriously ill. The doctors despaired, and the father rushed to Rabbanim and Rebbes for brachos. Nothing worked; his son’s life hung by a thread. The Chofetz Chaim was traveling to Warsaw to attend an Agudah conference. A great multitude of people stood waiting for the train to get a glimpse of the tzaddik hador. The desperate father came to Warsaw in the hope of getting a blessing for his son. The father rushed home to repeat the words of the holy Chofetz Chaim. The son agreed to stop driving on Shabbos and restrict his business to weekdays. As his father had been promised, he made a complete recovery. “If you accept My Torah and guard My Mitzvos… I will give you Shabbos.” And Shabbos is the source of all Klal Yisrael’s brachos! I recall seeing, when I was a boy, a book called The Jewish Family Picture Album. One picture stayed in my mind. It was of a Yid with a long beard who clearly had not found America very golden. He sat ragged and alone in a New York hovel, with just one candle and one Shabbos challah, all he could afford. He had found that the grinding poverty of the Old World continued in the New. Still, this Jew held on tenaciously to the Shabbos. I fully expect, as a consequence, the Shabbos Kallah brought him her shalom and her brachos. One of my closest friends in London is Alan Goldberg. His father was someone I admired and liked very much. He passed away Erev Pesach 2016 at the ripe old age of 96. Bertie Goldberg and his brother arrived in the U.K. as refugees from Czechoslovakia. London for him and most of the other Jews who found safety there was like the experience of the Jew in New York. It was anything but golden. Together with many other frum Jews, Bertie found work in factories in and around London — until it came to Shabbos. That’s when they had to explain to their employer that they could not work the next day, and that is when they were fired. This became a weekly routine: a new job that lasted until Friday, and then a search for another factory and another week’s work. To “blieb ah Yid” is to keep Shabbos and understand that when the Kallah arrives, we don’t try to “tinker” with Shabbos’ message. Ultimately Hashem decides and directs our lives and decides how much of life’s bounties we should receive. Bertie kept his promise to his father and passed the promise on to his children and their children too. He eventually became very successful and raised a family his father would (and is) rightfully proud of. Hashem keeps His promise of giving us a taste of Olam Haba when we accept His Torah and guard His mitzvos. 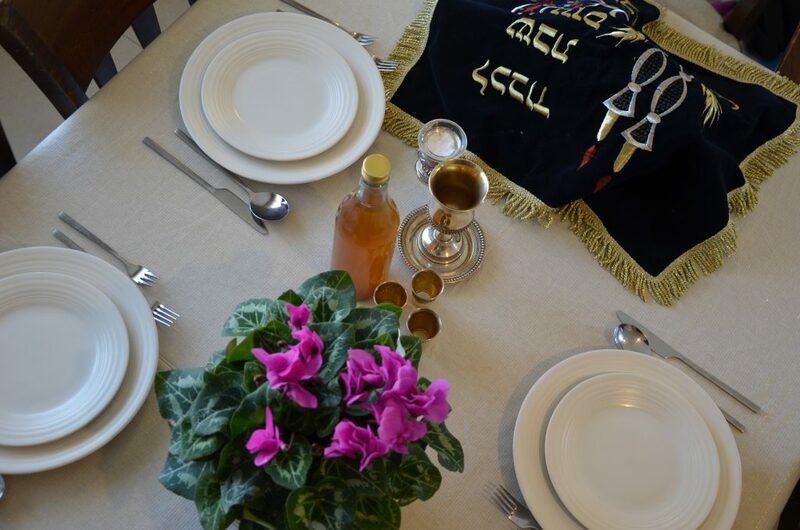 The mad scramble and the hectic rules of this world disappear when Shabbos appears. When we stop doing our work, Hashem stops doing His. He is no longer hidden, and Shabbos bestows shalom and a closeness to the Borei Olam, Who is of course the Source of all brachos.